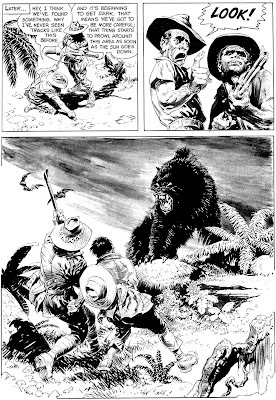 It is about time I share some work of one of the world's most talented and best loved fantasy artists, Frank Frazetta. I stop short of saying what I really believe, that he is in fact THE premiere fantasy artist. Practically everyone is aware of the amazing paperback book covers Frazetta painted for Lancer Books, depicting the greatest characters of Edgar Rice Burroughs, Robert E. Howard, and others. Of course he also was the main cover artist for the Warren magazine line in it's inception. I don't know anyone in the comic/art world who hasn't been influenced by his incredible body of work. In recent years, Frank has suffered many hardships. His health was adversely affected from years of painting in a fairly enclosed space which in turn caused him to inhale toxic fumes from paint thinners and turpentine, and a series of strokes has severely limited his ability to paint and draw with his right hand, so he in turn has been using his left hand, and also turning more to sculpture. Most recently, Franks lovely wife Ellie (who has many times served as a model for Frank), who was also his brilliant business manager, passed away in July, 2009, after battling with cancer. 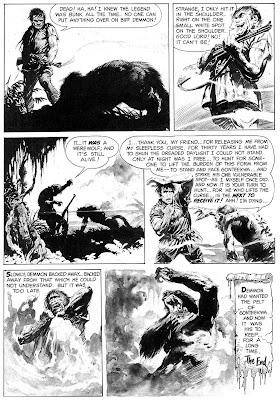 It unfortunately has been a rough times for America's greatest fantsy artist recently, and on behalf of the millions of his fans, we offer Frank Frazetta our deepest condolences, as well as our best wishes for the days ahead. So much has been said about the man's art, I have only one observation to point out. His skill at composition is I believe THE BEST in comics. 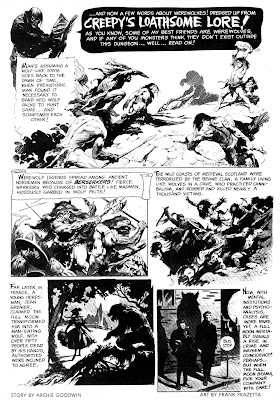 When Frazetta draws comics (as well as in his paintings and sketches), he composes each panel in a way like no other artist. Frazetta is the master of composition, truly. 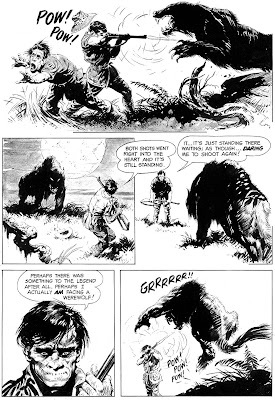 I have never seen a single panel of his that did not have every single element in it's proper place, artistically designed to flow and draw the eye from one point to the next. I mean it. Look at each panel as a mini painting, a mini work of art. Fantastic! Incredibly talented! If only more comic artists would take the time to study Frazetta's comic work, I'd be buying more modern comics! Sadly, there are scant few professionals working up to this caliber nowadays. 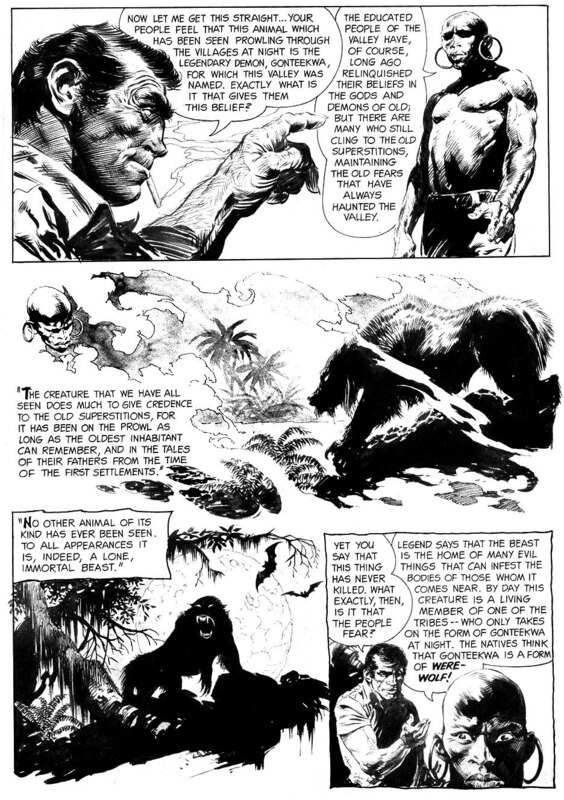 As an extra bonus, here is Frazetta's artwork for CREEPY'S LOATHSOME LORE, witten by Archie Goodwin. From CREEPY # 2. 1965. 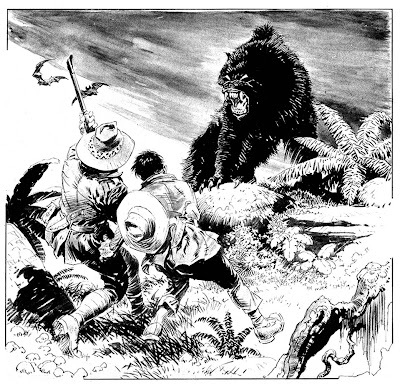 Love the grey tones in this B & W work of Frazetta~ glad you didn't bleach them out in the scanning process. His rendition of a Werewolf is tops~ ! 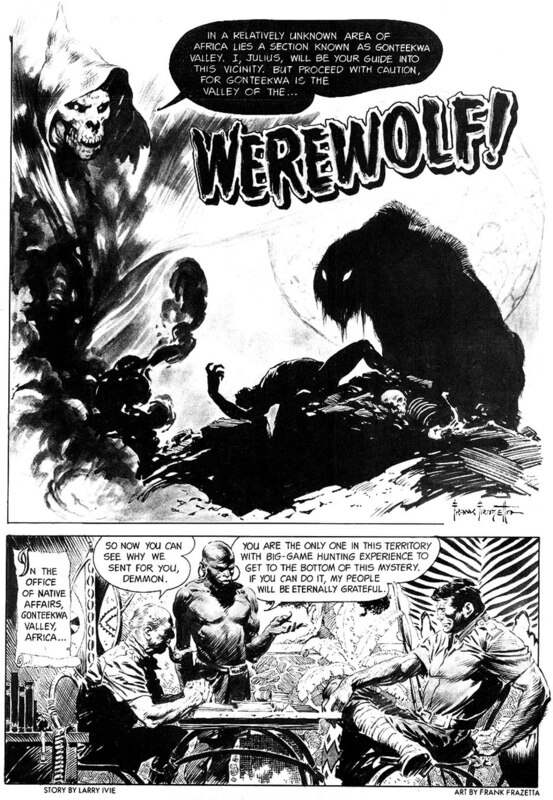 John Bolten draws a mean (scary) version of Lycanthropic humanoids in Epic Comics King Kull Special #2 if yer flipping through boxes @ yer local shop~ grab it fast ! Apocolyte: I agree, as I often do, with Lysdexicuss regarding the use of grays. Man, does that give a drawing depth and weight. I agree with you, Acocolyte: This is the premier fantasy artists of all time. So often copied, never, ever equaled. Pick a panel. Any panel. The panel you have selected as your intro is wildly beautiful, but even in a panel as simple as the first panel of page 2, his genius shines. Such brutal perfection and power in everything he did. Something almost primal about his work. Incredible new blog. Keep it up. Thank you all - so many amazing and talented artists that deserve to be shared and enjoyed and re-enjoyed! The pleasure is mine! Thanks for the post. If I am not mistaken, this was Frazetta's final comic book pages. Absolutely wonderful stuff. My wife and I highly recommend that you make the pilgramage to Frazetta's museum in Marshall Creek Pennsylvania. May God eternally bless Ellie Frazetta. Amen, Bob. 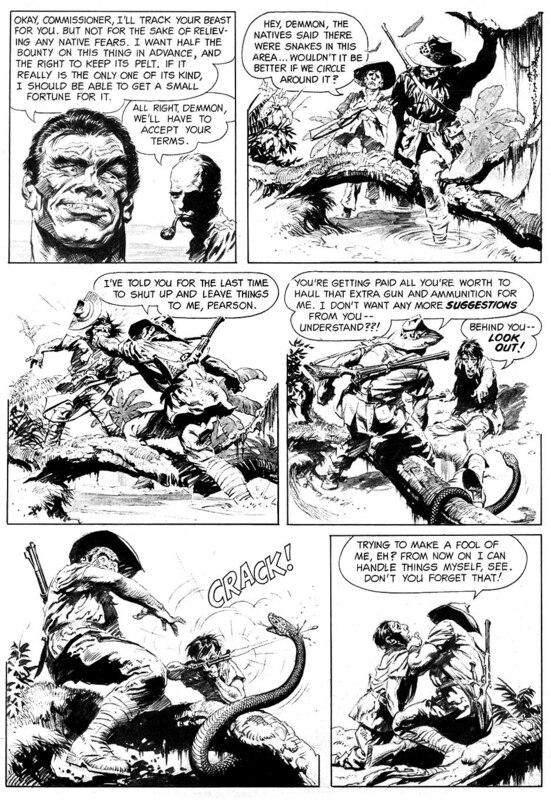 Thanks for pointing out the fact about this being essentially the last comic story Frazetta did. 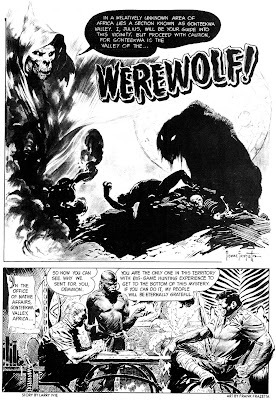 Although he also did a couple of one-pagers for Vampirella, the rest of his comic book work has been either reprints or covers.